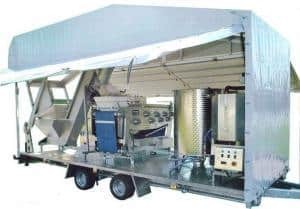 The Kreuzmayr KML series of mobile juicing trailers are an ideal way to take fruit juicing to the fruit grower. 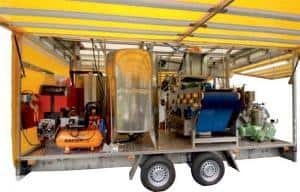 Only a power supply, a hosepipe, and a waste water drain are needed to operate the mobile juicing trailer. 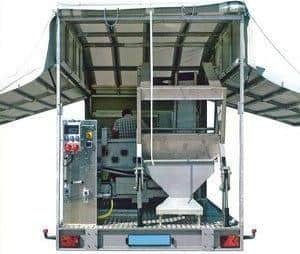 Fruit is loaded onto the trailer (with or without GKE bin tipper), then washed, milled and pressed into juice in a continuous process. The juice is is heated to around 85° Celsius by the on board pasteurizer and then filled into Bag in Box or bottles. There are 3 versions available which vary in output. 500, 750 and 1500 liters/hour. All systems are configured to handle the set amount. Enables fruit growers to produce juice from their own fruit. Pallet boxes of apples, pears, quinces, etc are emptied into the on-board washing tank by the box tipper. They are then elevated into a mill, ground into a pomace and fed into a belt press. The juice is automatically pumped into tanks, whilst the pomace is discharged from the press into a pallet box. The pasteurizer draws the juice from the tanks and gently heats it to approximately 85° Celsius. It is then pumped to the filling machine, which can be either a bag-in-box or bottle filler. Each machine can be used individually, or together as part of the system. Once finished, the equipment can be dismantled without the need for tools for ease of cleaning or maintenance. Each unit can be adjusted to individual needs.